First of all, the nature of God is a core doctrine that is the foundation of everything one believes. Mormon Apostle Dallin Oaks told an audience at Harvard Law School, “For us, the truth about the nature of God and our relationship to Him is the key to everything else” (“Fundamental Premises of Our Faith,” 26 February 2010). 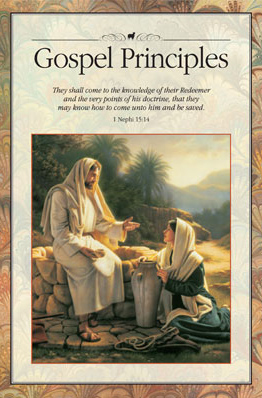 “Joseph Smith taught: ‘It is the first principle of the Gospel to know for a certainty the Character of God. … He was once a man like us; … God himself, the Father of us all, dwelt on an earth, the same as Jesus Christ himself did’ (Teachings of the Prophet Joseph Smith, sel. Joseph Fielding Smith , 345–46). To sum up, the “whole theology of Mormonism,” affirmed by a Mormon apostle five years ago and included in a Mormon Sunday School manual updated just three years ago, is the doctrine that God the Father was once a man like us. Furthermore, he is now an exalted, glorified, resurrected Man, who has set the rules whereby human beings may grow to the same status (i.e., godhood) themselves. If you are a Mormon and do not know this – the whole theology of Mormonism and the whole point of the Mormon Church* – it would be good to ask why. And an even more important question: What else don’t you know about Mormonism? My friends, the Mormon view of the nature of God (and man) is unbiblical, and therefore unChristian. If you are shocked or offended by the teaching that God the Father was once a man “like us” who “succeeded” in attaining the status of godhood (exaltation), “Then put away the foreign gods that are among you, and incline your heart to the LORD, the God of Israel” (Joshua 24:23). This entry was posted in God the Father, King Follett Discourse, Nature of God and tagged Brigham Young, Dallin Oaks, godhood, Henry B. Eyring, Joseph Smith, King Follett Discourse, Lorenzo Snow couplet, Nature of God. Bookmark the permalink. 73 Responses to Does Mormonism still teach God the Father was once a man? to start out the door of his Ward soon and make that journey . I think you have received some very good answers from the other posters. However, I would like for you to define for me what the word “good” means and what encompasses the “doing good” on your part at the local LDS ward. Also, what are you “good at”? I will tell you from the Bible what you are good at: absolutely nothing. Well, I guess one thing: continue in your free moral agency to sin continually and thoroughly in rebellion against a holy God fulfilling the desires of what you want to do in your sin nature (Rom 3:10-12; Gen 6:5; Gen 8:21). There is nothing you can do to please God in your current sinful condition in rebellion and hostility towards a sovereign and holy God through your suppression of the truth in favor of fables from the infamous Joseph Smith (Rom 8:6-8). The Christian church is full of fakes and covenant breakers (see the parable of the wheat and tares – Matthew 13:24-30, 36-43). The Church has sheep and goats. Look at this way; if you remain a goat in your rebellion against God by engaging in polytheistic religious practices as taught by Joseph Smith, you will be in company with many more goats at the LDS ward. However, if you go to a true Christian church that teaches and preaches the gospel, then the pendulum will swing the other way and you will be with probably less goats and more sheep. Your turning into a sheep from a goat is more probable in a Christian church instead of the LDS ward. Repent of your sin and come to Christ. Now. Here’s the further problem, Fred. What form was Jesus Christ in prior to his birth in Bethlehem when he was in his pre-mortal, preexistent state? 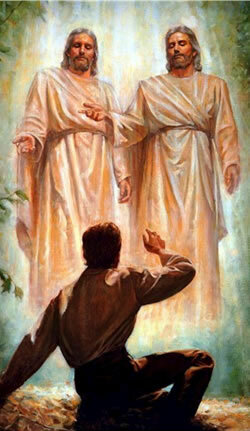 The pre-incarnate Christ of the Old Testament is still a spirit in the preexistent state in Mormon doctrine! He had no body! Your heavenly father living near Kolob never appeared to anyone on earth post-fall from Eden. I would urge you to seriously think this over and consider it. I don’t know of any Mormon that I have ever talked to that has. You be the first. “I’m not really interested in what different men “think” about a certain scripture. I am more interested in what Jesus and scripture actually says. Sometimes you have to put scripture together and cross reference things. Yes, I can. But you have made it clear that you don’t want to hear what “men think” about these and earlier scriptures. You are sure you know exactly what God has said, and anything I say will be irrelevant. There really isn’t a way to carry on a conversation that way, so I’m going to go ahead and bow out. As always good to talk to you. Fred, your real problem and dilemma is within Mormonism. Nevertheless, let’s address the issue of people seeing God “face to face” or in other ways in the Bible. Appearances of God are called “theophanies” in Christian theology. More specifically, a “Christophany” is an appearance of the pre-incarnate Christ in the Old Testament. When it comes to deity, nature, essence and substance within the ontological trinity, there is no difference between the Father, Son, or Holy Spirit. They are distinct persons, but not separate. They cannot be separated in their nature and essence. Exodus 33:11 says that “the LORD used to speak to Moses face to face, just as a man speaks to his friend.” The phrase “face to face” in Hebrew means personally, directly, or intimately. Moses had this kind of a relationship with God (Deut 34:10). Moses was a mortal man and never saw the “face” (Exodus 33:20, 23) of God directly. God’s face is God’s full presence. God’s essence = God’s face (Hosea 7:2). Is the cloudy pillar “face to face” in Exodus 33:9? What about from the midst of the fire in Deut 5:4? Please examine Deut 4:12, 15 and compare it with Deut 5:4 and Exodus 19:9. This is considered a theophany – an appearance of God the Father. What are some examples of Christophanies? There are many of these in the Old Testament beginning in the Garden of Eden going forward (Gen 3:8; Gen 18; Gen 32:24-30). Jesus was very clear that no one has seen the Father (John 1:18). God the Father is Spirit (John 4:24). A spirit does not have flesh and bones (Luke 24:39). Jesus is the image of the invisible God (Col 1:15). God’s “face” (essence and full presence) will be seen in Rev 22:4 in the eternal state. You reference the apostle Paul and suggest that someone “taught” him. If you look carefully at what Ananias did for Paul it wasn’t to “teach” him. God used Ananias as a instrument to heal Paul (Acts 9:17). So who “taught” Paul. Very simply, the Holy Spirit taught Paul (Galatians 1: 11-12). This is also the place where Paul writes about false gospels and not preaching one that even an “angel” might bring (Galatians 1:8). Joseph Smith claimed a “gospel” from an “angel” and it’s a false gospel just as Paul warns. “And as for you, the anointing which you received from Him abides in you, and you have no need for any one to teach you but as His anointing teaches you about all things, and is true and is not a lie, and just as it has taught you, you abide in Him.” The anointing teaches me. I’m not advocating that people not attend a church. What I’m saying is that the Holy Spirit resides in all born again believers in Jesus Christ. We don’t need a brick and mortar building. We are the temple of the Holy Spirit as the Bible also teaches us. The Body of Christ is very important as God has gifted each member in a specific way through the Holy Spirit to function within the Body of Christ. However it all begins with knowing Jesus in a personal way and receiving the Gift of the Holy Spirit whom the Father sent on the Day of Pentecost. I don’t care what church someone “attends”, if they aren’t born again by the Spirit of God through faith in Jesus Christ, they aren’t saved. Falcon keeps saying that for the most part he does not attend a Church. This seems to bother people, Why? I look at it this way, What if Falcon knows the word of God really well, reads His Bible and knows it better than most, And I believe he does. Then he goes and checks out some local church’s but find they dont know the word of God and maybe even deny much of what the Bible teaches. Sadly now a days many churchs are like this, One book you can read is called, Faith undone, by Roger oakland. So IMO it would be better to sit home and read the Bible and study it, then to go to a church where they no nothing. What about foreign countries where Churchs are not allowed and you will be put in Jail or be executed for going? China comes to mind, yes they have state run Church’s but they are not teaching the word of God. What did believers do before Church building were made? They had home church’s. So people can harp all they want, and I do believe we should meet together to fellowship, but if we cannot because of false teachers or laws or what ever, then simply reading will still be good enough. Figures of speech involving analogies are used throughout the Bible. The most common ones are simile, metaphor, indirect analogy, hyperbole, personification, and anthropomorphism/zoomorphism. For our discussion involving God’s “face” as thought of being literal by the Mormons, the liteary device of anthropomorphism needs to be examined. An anthropomorphism is the representation of God with human features or human characteristics. It is very clear and direct in Scripture that God (the Father) is (a) spirit. Jesus clearly stated this in John 4:24. The Father is an eternal, transcendent, omnipresent Person. Our finite mins as humans cannot grasp and understand what this is like. Therefore, the authors of Scripture use figurative language in describing a Being that makes it easier for us to understand in our thinking and language. We find multiple examples of anthropomorphisms in the Scripture. For example, God is described as having an arm (Job 40:9), a back (Exod 33:21-23), breath (Job 33:4), ears (2 Sam 22:7), eyes (Psalm 34:15), a face (Exod 33:11), feet (Gen 3:8), fingers (Deut 9:10), hair (Dan 7:9), a hand (Dan Psalm 95:4-5), a head (Dan 7:9), a heart (2 Chron 7:16), lips (Psalm 89:34), a mouth (Deut 8:3), nostrils (2 Sam 22:9, 16), shoulders (Deut 33:12), and a tongue (Isa 30:27). When animal imagery is used to describe God, the figure of speech is called a zoomorphism. An example of this is Psalm 91:4. This passage does not imply that God is a bird or that He resembles a bird in any physical aspect. There is a definite analogy being suggested by the text between God and birds. The image of a mother hen or bird surrounding her chickds with her wings to protect and comfort them is the way that God comforts and protects His people. What good has it done for you to attend the Mormon church where you are taught, if that teaching is of a false gospel promulgated by false prophets and teachers? Mormons make a huge mistake in that they mistake devotion,’ sincerity, piety and feeling as truth. Mormons may walk out of a meeting, even General Conference exclaiming that they could “really feel the spirit”. What they don’t quite understand is that “feeling” something doesn’t equate with the presence of the Holy Spirit. It’s very easy to create a “feeling”, an ambiance. That’s pulled-off everyday by unscrupulous hucksters and flim-flam agents. False religious teachers are experts at seducing people through feelings mistaken for the presence of the Holy Spirit. Play the right music, have the correct lighting, use the right words and a “spirit” is created. Attending a church that is good at creating a “spiritual feeling” won’t do much more than feed someone’s emotions. What people need is for their spirits to be fed by the Holy Spirit and this comes from a correct understanding of and teaching of God’s Word. That’s why the apostle John talks about the anointing of the Holy Spirit and the teaching that comes from Him and leads people into all truth as Jesus promised. There’s a Gift of the Holy Spirit called discernment. The lack of this gift is what leads Mormons into all sorts of error; specifically that dealing with the nature of God. It’s kind of funny. As of late I’ve turned into a church attender. I actually look forward to going and don’t want to miss. The focus of the service is on praising God and the preaching of the Word. Of course as the preacher is preaching I’m slicing and dicing every word but that doesn’t take away from the benefit I’m receiving from hearing the Word preached. My guess is that most of the Christian posters here do the same thing. That’s the problem with Mormons and Mormonism. They just accept what they’re told. All-be-it we have some Mormons like TJay who take the errors they hear and compound it into significantly more error and make the resulting new error comfortable to their own set of heretical beliefs. Anyway you are absolutely right. Going to a church that doesn’t teach God’s Word is worse than not attending at all. Returning back to Exodus 33 where Moses and the Lord spoke “face to face,” God’s glory is passing by as Moses is hidden in the cleft of the rock (Exodus 33:22). The text says that God will cover Moses with His hand until He has passed by. God’s hand will be taken away in Exodus 33:23. Moses has been placed in the cleft of the rock, but God has placed His “hand” covering Moses. How? If one is to take this literally it becomes very problematic. This would portray God as a Being with very long arms and hands that can cover Moses as God passes by at the same time. Using the Mormon hermeneutic for interpretation, why would Moses be able to see God’s “hand” and “back” but not His “face”? Using Mormon reasoning, is Moses only allowed to see certain body parts? No. These are figures of speech. How big are God’s “hands”? Figurative language is used again in Isaiah 40:12 that describes God’s “hands” as being so large that He can hold all the waters of the earth in the cup of His “hands.” I would hardly doubt or believe that this would fit the idea of the Mormon represenatation of God being a man in the normal sense that human beings are physically contructed. This certainly doesn’t fit with the LDS heresy of stating that God is an exalted man who became deity. God the Father is not a man (Isa 31:3). Andy, thanks for sharing the clear Biblical truths about Jesus as Jehovah , the God of Israel. people were being taught some very confusing “truths” about Jehovah from their apostles . issued unstable teachings on vital truths. I think that Ralph had the right of things (about how Mormonism approaches this doctrine NOW) in his first comment. I’ll tell you why. 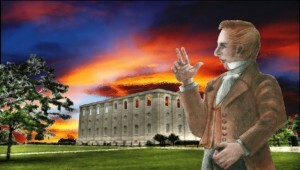 When Smith revealed his bombshell in the Nauvoo Grove in 1844, it was the culmination of years of Smith’s evolution of various dogmas. His King Follett discourse invited speculation, especially in the light of Smith’s subsequent assassination. Starting with the Trinity Doctrine in the early 1830’s, and progressing to Modalism and then full blown polytheism, his magnum opus was the blending of Masonic rituals with his self-aggrandizing revelations that men can become just like God, and that this has been going on forever, an “eternal round” that was easy to explain to those who could receive “revelation”. He said he could “take away the veil” so men could see the “truth”. Smith himself said that he could “comprehend God”, and that all should shut up and listen. He said that if this wasn’t true, it “becomes my duty to renounce all further pretensions to revelations, inspirations, or to be a Prophet; and I should be like the rest of the world—a false teacher”. Here is Mormonism’s dilemma. Brigham Young needed to prove that he was a prophet too. That he could get revelation just like his predecessor Smith. 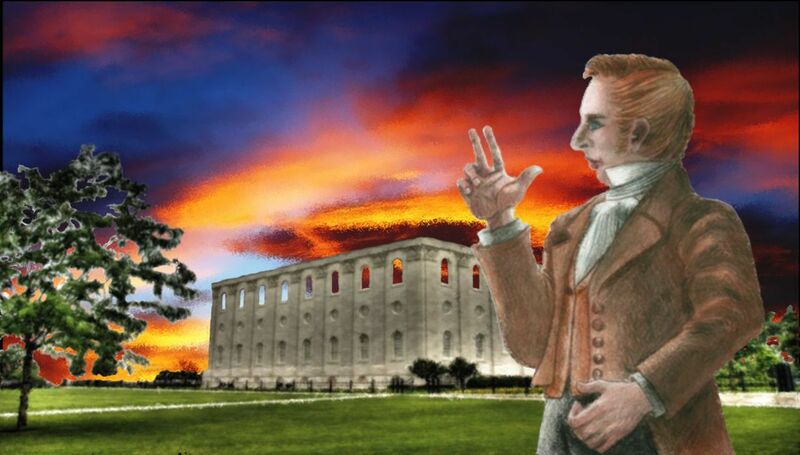 He had to show that he too, had the “Holy Ghost”, and that he was “learned” and could answer the questions of the followers of Joseph Smith. Mormons wanted to know the answers, and they felt they had a prophet who could give them. Young himself used the same line in 1854 at a General Conference, telling the church that “I know the Lord blesses his people with temporal things in abundance, and wishes to bless them with knowledge and understanding that is not for the world of mankind who do not believe in him.” (October 8, 1854 Discourse of of Brigham Young compiled by Eldon Watson). Although Young (and Smith) said this could be proved from the Bible, this is not true. It could not be. It could not be proved by the Book of Mormon either. It was new “revelation”, and as Smith said, if it wasn’t true, he was a false teacher. was passing through this or a similar ordeal. ” [ Gospel Doctrine, p. 54 ]. through the equivalent of every earth phase of the Great Plan, which we are working out. advancement .” [ A Rational Theology. A Melchizedek Priesthood manual (1915) p. 62-63]. of Rev 4:8-11 , he believes that he’ll also be worshiped as an Almighty God one day. have strayed from the gospel that Jesus directed His original apostles to go and teach . Smith, Young and the early “prophets” of Mormonism were sure about what they taught. That is until they “evolved” into more understanding, knowledge and light and then they became sure of that. These guys would suppose something, imagine it, have thoughts about it and call it revelation. We see the fruits of this today in guys like our friend TJay. Knowing how Smith and Young processed information, we can better understand Mormon guys like TJay. I think there’s more than a little arrogance at work here. It’s a form of pride and the puffing of ego and a form of psedo-intellectual snobbery. Some Mormons like Ralph aren’t into what TJay is into. Ralph is simply left to sort of “spin” what these early prophets said and try to come up with some plausible explanation. Ralph, for example, knows what the church fathers taught. So this idea of a “restoration” is a farce. Ralph suffers to try to hold on to something he wants to believe in. TJay just makes something new up and is making himself equal with Smith and Young in his imagination suppositions. Quoting Biblical text was thrown out the window with these two early Mormon prophets. They just elevated their own thinking to a level of Scripture. When necessary they’d pull a Bible verse out of thin air and mold it to support what they had created. As Christians we stand on the Biblical text and the traditions of the Church. Mormons can’t stand on either one. They can’t even stand on the traditions of their own church or Smith’s “revelation” the BoM. Mormonism is a fly by the seat of your pants, make it up as you go along religion. I think some of these modern day Mormons are really acting in the spirit of old time Mormonism. That is, just sort of “reflect”; think about spiritual matters like the nature of God; get ideas when they’re thinking, reflecting and considering and see it as revelation. If you get some conflicting ideas latter, don’t worry. The process is progressive. Maybe the Unity form of religion would fit these folks. The idea of God being every where would give Mormons pause since the Mormon god is limited. But really there’s lots of room to wiggle in the Unity program. Think of the freedom to “….. apply Unity teachings based on your own spiritual understanding.” This would appeal to many Mormons. There’s a tradition of making it up as you go along in early Mormonism. Since the modern Mormon prophets aren’t really willing to go out on a limb and say little except be good and tithe, individual Mormons need to strike out on their own.